Our course is 6.25 with no hidden cost. 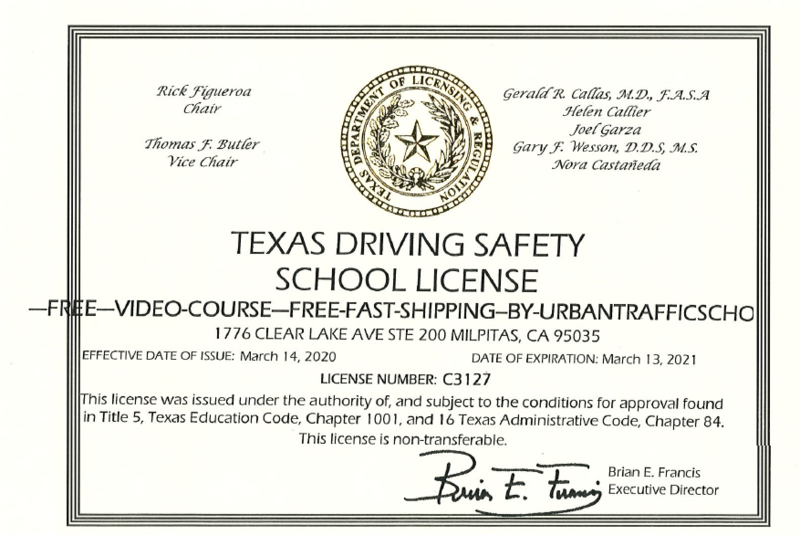 When we started Urban Traffic School, we promised ourselves not to charge ridiculous prices to those who just paid a couple of hundred dollars for their traffic ticket. No Final Exam to Pass! When you complete our online program before 3PM CST, we will mail in your completion certificates via United States Postal Service on the same day. For those who need the certificate on more urgent bases, we can send your certificate via Email or via sealed envelope by FedEx Express. Our Online 8 Hour Driver Improvement Course offers a self-paced curriculum that will save you both time and money. When you get a ticket in Missouri, as a Missouri Driver you can take our course and have points dismissed from your record. For out of State Drivers, be sure to talk to your court to see if you can provide them our completion certificate to have your ticket either dismissed or to have reduced fine. Most of the Auto Insurance companies in Missouri will accept our Driver Improvement Course Certificate to give you a discount on your auto insurance premium. Contact your Auto Insurance Agent today to see if you qualify. When you complete our online program before 2PM PST, we will mail in your completion certificates via United States Postal Service on the same day. For those who need the certificate on more urgent bases, we can send your certificate via Email or via sealed envelope by FedEx Express. Our Online 5 Hour Traffic Safety School Course offers a self-paced curriculum that will save you both time and money. 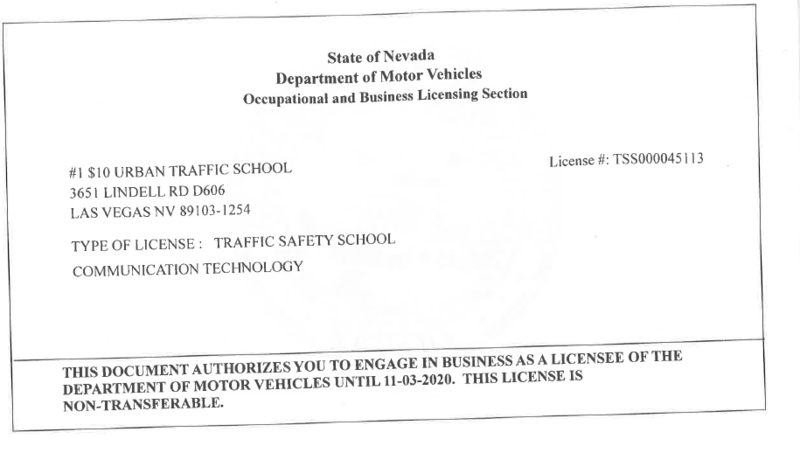 When you get a ticket in Nevada you should ask your court to allow you to take Traffic School. Even for out of State Drivers, be sure to talk to your court to see if you can provide them our completion certificate to have your ticket either dismissed or to have reduced fine. Our course format is created with YOU in mind. Every time you complete one of the chapters your course progress is saved, so you can return anytime to begin where you left off. Our short quizzes also help you prepare for the final exam. Most of the Auto Insurance companies in Nevada will accept our Traffic School Certificate to give you a discount on your auto insurance premium. Contact your Auto Insurance Agent today to see if you qualify. When you complete our online program before 5PM EST, we will mail in your completion certificates via United States Postal Service on the same day. For those who need the certificate on more urgent bases, we can send your certificate via Email or via sealed envelope by FedEx Express. Our Online 8 Hour Driver Improvement Course offers a self-paced curriculum that will save you both time and money. 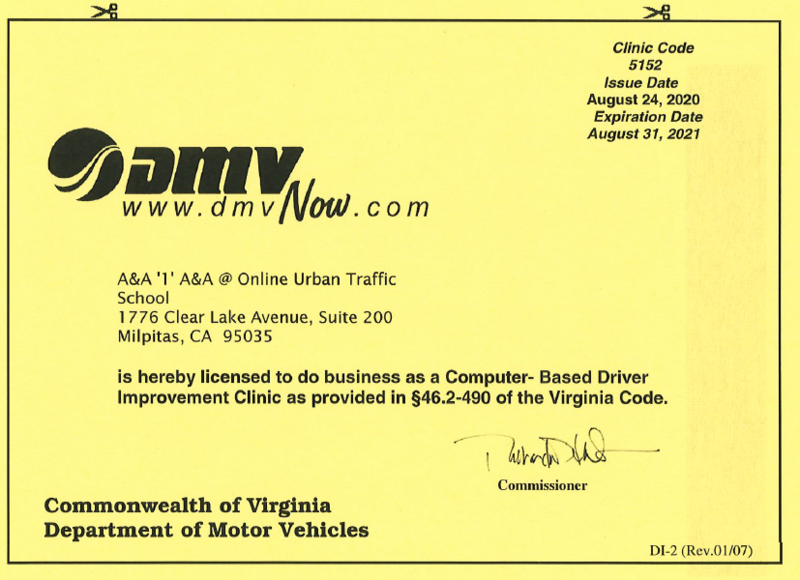 When you get a ticket in Virginia you should ask your court to allow you to take Driver Improvement Clinic. Even for out of State Drivers, be sure to talk to your court to see if you can provide them our completion certificate to have your ticket either dismissed or to have reduced fine. By taking our course, you can earn up to 5 Safe Driver Points. This will result in you knowing better driving techniques and also lower insurance premiums for you. Most of the Auto Insurance companies in Virginia will accept our Driver Improvement Course Certificate to give you a discount on your auto insurance premium. Contact your Auto Insurance Agent today to see if you qualify. Some courts will require you to have us mail in your completion certificate directly to the courthouse or to you. We charge a nominal fee for this service. Out of State Drivers can take the Final Exam at home. Made to be easy, fun and simple. When you complete our online program before 6PM EST, we will mail in your completion certificates via United States Postal Service on the same day. For those who need the certificate on more urgent bases, we can send your certificate via Email or via sealed envelope by FedEx Express. Our course format is created with YOU in mind. Every time you complete one of the chapters your course progress is saved, so you can return anytime to begin where you left off. Our short quizzes also help you become a better driver. On average our users have found our course to be quicker than any other defensive driving school. Over and over again, we are complemented on the easiness of our course. We also email you the course enrollment and completion confirmation without any charge instantly.